Larry is the founder and CTO of Wordstream and Mobile Monkey which is a service that develops online marketing software and helps companies optimize their PPC ad campaigns. He is considered one of the most influential PPC experts in the world and he’s a frequent blogger for Search Engine Land, MOZ, Search Engine Journal and other top business publications. In this episode, you will learn about how he started Wordstream and how to run profitable PPC campaigns the right way. How Larry leverages content to run profitable ads. 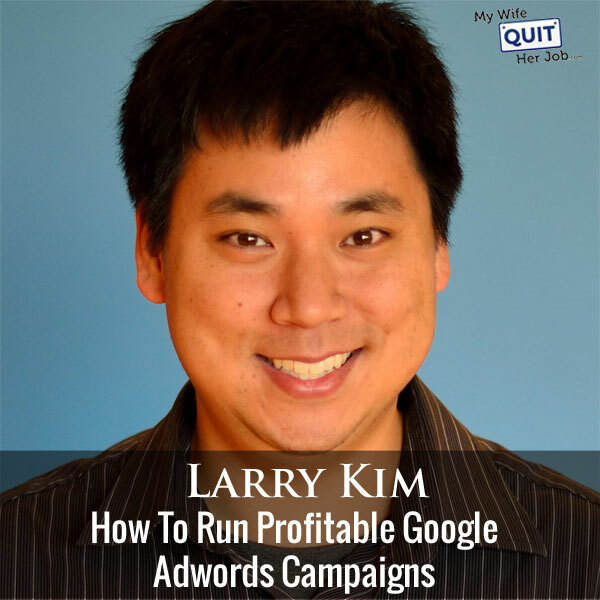 Today I’m thrilled to have Larry Kim on the show, and if you’ve been doing SEO or any search engine marketing for the past couple of years, chances are you’ve heard of Larry. He is widely regarded as one of the foremost experts in Google PPC, and today we’re going to have him teach us how to run profitable AdWords campaigns. Now before we begin I want to give a quick shout out to Seller Labs who is a sponsor of the show, and specifically I want to talk about their brand new tool Ignite which helps sellers manage their Amazon sponsored ads. Now I’m excited to talk about Ignite because I’ve actually been using this tool to manage my Amazon sponsored ad campaigns, and it makes things a heck of a lot more convenient. So number one I’ve always found it a major pain to generate my PPC reports on Amazon, cut and paste the data over to an excel spreadsheet and then use pivot tables before I can do any sort of analysis. Well Ignite allows you to aggregate and visualize your Amazon sponsored ads data quickly right within the tool to see immediately what keywords are working and what is not. There is no need to manually create reports or play with excel, everything is right there for you right on the interface. And second of all unless you’re a data geek, Amazon campaign data can be hard to understand, and what’s cool is that Ignite makes keyword and bidding recommendations on the fly that can be applied with a single click. So for example let’s say one of hankie keywords is bringing money, well Ignite will actually alert me of that fact and I can reduce the bid immediately with just a couple of clicks. So bottom line Ignite makes managing your Amazon sponsored ads so much easier and the fact that they provide me with alerts means that I no longer have to monitor my campaigns like a hawk. So if there are keywords that are doing well, Ignite tells me to add them to my exact match campaigns. If my keywords are losing money well then Ignite tells me to either remove the keyword or to reduce the bid. So head on over to sellerlabs.com/steve where you will find awesome tutorials on how to run Amazon PPC ads and the opportunity to try Ignite for 30 days free. Once again that’s sellerlabs.com/steve, now on the show. Steve: Welcome to the My Wife Quit Her Job Podcast, today I’m thrilled to have Larry Kim on the show. Now I had Ryan Deiss on the podcast a couple of weeks ago and I actually met Larry through Ryan’s conference Content and Commerce. Now Larry is the founder and CTO of WordStream which is a service that develops online marketing software and helps companies optimize their PPC ad campaigns. What I like about Larry is that one is he’s an electrical engineer just like I am and two he’s a family man. Anyway Larry is considered one of the most influential PPC experts in the world and he’s a frequent blogger for Search Engine Land, [inaudible 00:03:05], Search Engine Journal and other top business publications. If you read any of those, chances are you’ve seen his face on there. He’s also the author of the most shared PPC article of all time which I did not know until I read his bio, and today we’re going to learn about how he started WordStream and how to run profitable PPC campaigns the right way, and with that welcome to the show Larry, how are you doing today? Larry: Hey doing great thanks Steve, how are you? Steve: I’m good, I’m good. You know I read your bio but I’m sure like there’s a bunch of people in the audience who do not know about WordStream, so one what gave you the idea to create WordStream and was it your intention to create a software company, or did it kind of happen by accident? Steve: Hardware guy or software guy? Larry: Well actually they are kind of indistinguishable at this point, like if you’re building geeks or something like it’s all software. But yes basically just wrote some software to make my life easier like the keyword researching and the grouping and all that stuff. So initially it was six, seven years ago, so I was just – I’m lazy so I wanted to not have to do the same stupid things over and over again and just was using that to make my life more efficient. And then the light bulb went off and like wait a minute if this is so helpful to me maybe I can start the user interface on this thing and sell to companies as opposed to just using it internally for myself just to make my own life easier. So that’s kind of how we got started, I started pitching the idea to venture firms. To think about software is so competitive, there’s so many other companies, you can’t cut a lifestyle your way into a software business, we’re in a competitive market, you know what I mean. You got to be in it, all in to win, that kind of thing. So I wanted to raise money and then they all said no, but they all gave me good reasons like, oh you need more customers, you need more partners, you need more team that kind of stuff. So over the next year I bootstrapped the business using just consulting revenues to hire people and some marketers and sales people and engineers and basically finally after a year later went back to all those people who said no and two of them ended up making offers for our company of four million or so give or take, and that’s kind of history like that’s how we got started or I got started. Steve: It’s interesting that you felt like you needed funding because I’ve had a lot of people on the podcast who’ve kind of bootstrapped their software companies as well, is it because you had much higher aspirations for your revenue numbers I guess? Larry: Well yeah basically there was – the thing about software is you have to have an interesting like work technology has an infinite lifespan if you know what I mean. There’s enough pain in the market and someone is going to solve that pain, and then at some point it’s going to go away. So I just felt a lot of pressure because there were other companies that were doing PPC management software, they were two or three years ahead of me, and it was kind of like win or take these kind of things for competitive reasons largely. That process like software is ridiculously expensive to build like I employ 30 engineers right now and so that’s like it’s a lot, so it’s nice to be using someone else’s money. Steve: Yeah no totally that’s true in the risk perspective. But on the other hand they have higher expectations too. Larry: Of course, that’s a game you’re playing, there is a lot of pressure too to try to grow the company as fast as you can and you lose all the control over your destiny actually. Steve: So what does your software do exactly for the benefit of the listeners and how does it differ from just using the AdWords editor for example? Larry: There is nothing you can’t do in our software as AdWords editor, the difference is in AdWords editor it’s kind of like an expert driven workflow, so you kind of have to know Steve what you want to do, you’re like, oh I’m going to add some keywords now, I’m going to now add some ads. Like you need to be able to know what it is you’re diagnosing and then go in and fix those things. So WordStream it’s more a machine guided work flow, so it does the analysis for you and just tells you like, look Steve here’s three things I want you to do this week and it will take you like five minutes to do because often times there’s millions of advertisers, not all of them are like full time marketers, a lot of them are like think of other things going on. So it’s kind of like how millions of Americans use something like trouble tax to prepare their taxes. They don’t really need to know anything; it just tells you what to do. Steve: So basically it allows a non expert to use AdWords effectively? Larry: Yes prioritizing the impacts of the workflow they are doing because we just don’t want spending too much time in there, so it’s like search marketing you could spend 80 hours a week on this stuff if you wanted, but we all know that maybe 10 or 20% of the stuff that we do will generate most of the income, most of the leverage. Steve: Yes and because I teach this stuff I can say that the AdWords interface is probably one of the most complicated ones to explain, because there is like so many switches. Larry: Yeah it can be intimidating like it’s hard for marketers to understand this, but like if you’re just a business owner and marketing is one of 20 things you need to do, this is intimidating. businesses can profit from AdWords and are there certain companies that just are not cut out for either Shopping or AdWords from ecommerce perspective? Larry: Well I mean it’s not everyone can be successful; it depends on what it is you are selling, I mean really you want to be in some kind of a niche where the items are a little harder to find, like it’s not something you just pick up and it’s a CBS or something. Ideally there is some margins in there because it is a specialty item and ideally there would be some opportunities for repeat business as opposed to just buying this thing forever and never having to replace it. So yeah there is definitely niches that would do better than others like I’m thinking off the top of my head there is this one guy I met that we were looking into the account and they were selling like Amish gazebos, like oh my god this is like a high priced item, very specialty thing. So like that’s like the perfect example you know what I mean. So of course it depends on your niche but those are some of the characteristics that I would think of. Steve: Let me rephrase that question a little bit, so what would you say your margins, general guidelines we need to meet actually even have a chance at AdWords. Larry: Well generally speaking you cannot spend more than one third of your profit margin on the cost of customer acquisition. So if you’re only making a dollar profit on this thing, if you’re spending more than 33 cents to acquire the customer it’s likely that you’re not going to be able turn a profit because you need to see some margins for running the business or fulfilling the orders or all the other stuff, you see what I’m saying? Steve: Okay yeah, yeah, so let’s say we’re selling product that has fairly competitive keywords like clothing or jewelry, how would you proceed with an ad campaign with a limited budget, pretend you’re just starting from scratch and you only have like thousands of dollars to invest let’s say. Would you start with Shopping, AdWords, how would you begin? Larry: So the worst thing you can do is just kind of unbranded keywords on Google AdWords, that really is a suicide mission at this point because you’re competing against all these other ecommerce vendors. I think you need to have some kind of unfair advantage before, you know what I mean. Larry: So if you have $50 or some small number of marketing budget, you don’t want to just buy clicks at $2 or a dollar a click, that’s crazy. So you know what there is so much of this – is this a new site like obviously the low hanging fruit of PPC is actually remarketing, so going after all those people who put stuff into the cart but didn’t check out which is like 70, 80% of shoppers. I think one of the challenges is if you’re really new ecommerce vendor you might not even have a good amount of traffic to your site to begin with of people of low hanging fruit to go after. One of the first things that I would going after is sort of like brand awareness campaigns but in a targeted way. So I would think really hard about who the target market is for this thing, it’s like in the case of Amish gazebos it’s got to be like home owners who live in rural areas, outside of cities who are Amish, that kind of stuff who exhibit like maybe they like the Home Depot or [inaudible 00:13:40] that kind of stuff. I’d be thinking really hard about who the target market is, and then I would be show casing those unique products in a very memorable inspiring way, so like the most memorable and inspiring thing you could do is a video like show case the products. Create some kind of video and upload that video offering to your target market on things like Facebook just to create some awareness of the market, you see what I’m saying? Steve: So you’re just trying to get clicks to content essentially? Larry: Yeah and the cheapest way to do that is with really, really high engagement content, so basically on Facebook the ad prices inversely proportional to the engagement rate, so if you got a 10% engagement rate, that will be maybe 20 cents a click or maybe 10 cents a click, but if you can get that to like 30 or 40% engagement rate, maybe it’s like one penny a click. So I would just try really hard to come up with a compelling offering – sorry a compelling creative that’s just like wow, a lot of people who see this are blown away by it, and just get that in front of the right people. Steve: So what you’re saying actually is you wouldn’t actually start with Google Shopping or Google AdWords, you would start by building a remarketing list, is that what I’m hearing? Larry: I think so because shopping believe it or not Steve people don’t just randomly buy stuff from stores, their purchase decision is a reflection of their underlying tastes and preference for brands that they’ve known and heard of. So especially with shopping where the trust bar is higher up because consumers have taken a cough of their credit card and shipping and all this other personal information. I think one of the most critical things is to build some brand affinity for your business. Of course it varies by industry but that to me sounds like an interesting approach. Steve: You know what’s interesting to me is like when I first started my Google Shopping campaigns they were actually profitable right off the bat early on, and I think I attribute the fact that there was my offering and there was the price and so if someone were to click on that ad there was a much higher probability of buying it. And so from what I’m hearing from you right now brand affinity carries a huge part in Google’s Shopping ads as well, is that what you’re saying? Larry: Sure, customers are two to three times more likely to click on and then two to three times more likely to convert through on ads where they’ve heard of or are familiar with the business. Now there’s some caveats like if the thing you’re selling is such a commodity item like drone propeller blades or something, like I just need that now, I don’t really care where I’m getting from, maybe there’s exceptions. But generally people tend to transact at the companies that they’ve heard of and know and love in terms of their brand preferences. Like when you started your shopping campaigns was that like – did you have no presence online before and you just like day one did these shopping campaigns, or was there kind of like an ecommerce presence that preexisted and then you layered on top of that on shopping ads? Steve: Yeah that’s a good question. So I started out with the merchant center which was free back in the day, I can’t even remember what year that was now, was it like three years ago, four years ago, I can’t remember. Steve: More than that, yeah so I started out with AdWords actually, AdWords was – and this is a while ago, AdWords actually generated like huge portions of my revenue early on and then once the merchant center came out I used that and that started working well. So I guess there was already a little bit of brand affinity, because AdWords came out way before Shopping. Larry: That never had any affinity at all. Now it’s a completely different scenario if you have like lots of visitors and a preexisting site that has a good amount of traffic. I would go after those sections first like using Google Shopping and remarketing if you had a brand presence. Steve: Okay so you recommend putting out a compelling piece of content and then using Facebook first to get some traffic over there and gradually building up your remarketing list. So once you have this remarketing list then what do you do next? Larry: Now you remarket to them but not to every one of them because not everyone who visits your site is a perfect fit for the products and services you’re selling. What you could do is you could filter those audiences, maybe it’s like people who put stuff in the cart, maybe it’s people who had a very, very long session duration or maybe they have certain demographics that are favorable like they are very, very wealthy people or have certain desirable demographics where you just filter out that audience. Then the ones who do pass through your filter you should be marketing to them very, very hard like showing up in their feeds everyday just to make sure that they finish whatever it was you were hoping for them to buy. Steve: Do you feel like the Google demographic data is accurate, so one more time I just took context of Google, all those demographics, do you use those to narrow down your marketing list? Larry: It’s all based on search history, that’s how Google does their stuff so I mean yeah I think it’s reasonably accurate, yeah I think so. Steve: I guess what I’m trying to ask is with Google remarketing it’s different because they were search intent, and so would you further limit down your remarketing list from those people, whereas Facebook I feel is a little bit different, right? Larry: Sure, sure, basically if your main traffic source is just from like targeted Facebook ads or targeted search ads, then fine maybe you don’t have to boil it down a lot, but what if like a lot of your traffic is just coming from organic sources that you don’t even know where it’s coming from, you see what I’m saying? Larry: In that case you would have to kind of boil it down and kind of get to your top 5% of that audience, but you’re right. Steve: So I mean you do this a lot for a lot of companies and so I was just wondering if you could just kind of comment on what are some of the most common mistakes that you see people make when they’re trying to run their own campaigns? Larry: The biggest problem of all time is just lack of activity; the greatest thing about these PPC campaigns is that there are very measurable, like they give you a lot of data on what the cost per click is and how many clicks there are to go after. So the biggest mistake people make is they don’t learn and improve from the campaign data that has been provided to them. Steve: Okay are you referring to like negatives or what are you referring to specifically? the market is telling you something, maybe that’s not a very interesting product to be offering. So it’s just not taking the data and synthesizing it to make business decisions. Steve: I guess what I’m trying to ask is so we started out by making content and we’re using remarketing now, when is it time to add Shopping and AdWords to the mix, like how do you dip your toes in the water? Larry: The low hanging fruit would be things like retargeting based shopping ads and retargeting based Facebook product ads, those really are the low hanging fruit. Like if someone has – now we have your audience of people going to the site, only 2 or 3 or 4% of them are actually going to buy your stuff like on the first shot. So at that point when you have like a thousand sessions or something like that that meet your filters, that’s kind of a minimum because like it won’t work with fewer than that, but basically that’s when I would be layering and things like Facebook product remarketing and also Google Shopping through remarketing. It’s kind of like Steve you can always exchange quantity and price, it’s like the cheapest conversions are going to be your remarketing stuff. You can expand those efforts to non remarketing targeted ads and you’ll get more quantity, it’s just that the economics may or may not be as attractive; they probably won’t be as attractive. Steve: I want to take a moment to thank ReferralCandy for being a sponsor of the show. Now in this day and age word of mouth is a huge driver of business for most ecommerce stores, and the best way to amplify word of mouth marketing is through a referral program. This is where ReferralCandy shines, with just a couple of clicks of the mouse you could add a referral program to your ecommerce store and reward your customers for telling their friends about your shop. And this tactic works wonders; and in fact it’s not uncommon to get a ridiculous return on investment. So for example Greats Footwear, who is a ReferralCandy customer, is currently seeing a 20X ROI. Referral word of mouth marketing is also useful for building up your social media presence as well, because everyone is talking about your company with their friends on Facebook and Twitter. So based on the models that you kind of just presented just now, so one you have content which creates your marketing list and then you have just plain old keyword AdWords campaign where you’re just bidding on keywords outright and of course it’s going to depend on the type of company, but which strategy do you tend to go for more today, the content remarketing strategy or more like the outreach with keywords like very specific keywords? Larry: Well if you can get just regular keywords to work for you like if you’re running regular keywords with your – I call these vanilla [ph] keywords because it’s just going after people who are searching for these keywords, no additional strings attached. If you can get that to work for you, well then by all means do it. That’s great because why wouldn’t you, because it’s so measurable and if you’re acquiring customers below a third of your margins so that means there is plenty of margin left to drop to the bottom line kind of thing, then yes you are very lucky, that means you are in a very interesting, not terribly competitive space, but AdWords has been around for like 16 years. Larry: So there’s 3.5 million advertisers on this thing, so a lot of times the challenges like they try doing this and they’re paying for a $20 product maybe they’re spending $10 on the ad spend, so that’s not going to work. So then it becomes like okay so what do we do now and the answer is like well you can’t just do business as usual, you have to kind of change it up. Steve: That totally makes sense, that’s how I run all my Facebook ads as well incidentally, it just works out cheaper that way. Larry: Well yeah I think because the Facebook ads in particular, the way that option works it’s a lot more advertiser friendly than the AdWords option, the AdWords option is people – one idiot can like screw up the bids for everybody, because it’s like the cost you pay it’s directly proportional to the guy who is ahead of you in terms of AdWord. So when you get these very specific keywords with like 500 queries for a week or something like that, that’s very low inventory, so one idiot can screw it up for everyone, but in Facebook ads you’re going after demographics of people with larger audience sizes, and you can hit this person up for ads like they might be browsing for an hour a day, so that’s like many, many opportunities to get in front of that person. It’s like kind of supply and demand basically, it’s just Facebook – and plus Facebook there’s just less ads running through there. They only make about a third as much as Google does in terms of AdWord campaign. Steve: Let’s switch gears a little bit. In terms of running not Shopping campaigns but just AdWords campaigns for example, what does your landing page look like for an ecommerce store, is it a category page, product page, home page or like a lead page to gather leads? Steve: It does, I’m just giving a scenario, I’m just curious how you would approach the problem. Larry: You know usually the first try will just be to send them to a category – sorry to the money page like going to the product page. I mean that would be your first try, and then you would just see what the metrics are like and if it’s working, and then you’ve got a conversion rate of like more than 8, 9, 10% then that’s a pretty good signal that you’ve got a pretty good intent like matching the intent with the search. So anything 8, 9, 10 and above percent conversion rate that’s pretty good. If the conversion rates were closer to like 1 or 2% well then I would shake stuff up a little bit, you know like try those other ideas, like maybe, oh this isn’t exactly what I’m looking for so I’m going to send them to the category page and have them look around and browse from ten different types of [inaudible 00:29:39] or whatever it is that they’re looking for, because maybe it’s such a broad or blue dresses like maybe it’s very hard to know what type they were looking for, so they need to see a selection of them. So basically the guiding factor is your conversion rate like I was saying anything three or two, you should feel very safe in experimenting and making changes, because there is not a lot of downside risk, but if you’ve got something 8, 9, 10% and above then that’s pretty remarkable and I would stay put kind of thing. Steve: So in the beginning, let’s say you’re just starting out with the campaign, are you bidding just high to get like the top rank just to check your conversion rate, and then gradually dial it down, like what is your bidding process like and how do you reduce your bids over time? Larry: Well I mean bids is half of the thing and usually yeah I think you do need to bid a little more just to get some history and some of that quality scourge is flowing through your account. Google likes to favor the accounts that appear to be doing well and the loop hole is that it needs a little bit of a kick to get started, so yeah I would do that. Steve: The reason why I’m asking that question is often times you go on AdWords and you bid on a keyword and for example my keyword like it told me like the minimum bid was like $1.75 per click or something like that. And so when I start out – and this might not be the right strategy, but this is just kind of how I do it. I always bid like to get the top rank and then today I’m paying like 30 cents a click. Larry: Yeah so those minimum first bids, those minimum bid estimates are usually wrong, they are off by a factor of five times as much, so actually that kind of fits your description where you’re paying 30 cents even though it’s saying the minimum is like a $1.70 so it’s roughly five times. So you don’t – maybe you use those like initially but certainly there is room to go down like a lot. Steve: Okay I’m just trying to get an idea of your flow, so you got to plan the pump so to speak at first right by paying higher bids just to give Google some data, right? Larry: Yeah, another way to plan the pump is go for branded keywords, so quality is scored, all these things are computed at the account level as well as at the keyword level. So it’s kind of like how your mid terms and your finals for your course grades is 80% on your final and 20% on your mid-term or something, so there’s an account based component of your score. So if you have like these branded keywords where you’re spending 5% of your ad budget on the stuff but you’re getting like 60% click through rates, that really will increase the average score for all the other campaigns. Steve: So that also applies that you should be removing all the keywords that don’t have good click through rates at all from your account all together? Larry: I mean I would kind of delete the bottom 5%, usually there is a few of account that is kind of draining all the money and it’s like not working at all and people they’re like but I need to give it a chance, but like you’re actually better just counting your losses because it’s a bit like a cancer in that it impacts other keywords and campaigns. Steve: Here’s the thing though, what if you’re bidding on these keywords but people aren’t buying right away, and then later on you bring them back to like Facebook retargeting but Google AdWords doesn’t get credit for the click, how do you track these conversions? cancels itself out, you see what I’m saying? Steve: Sure. So how do you raise your quality score, because that determines how much you have to pay, so what are some tactics to do that? Larry: It’s just raising the click through rate and that’s like an 80% of the algorithm right there. The best way to raise your click through rate is actually two things, have more interesting stuff to sell, sometimes if you have this garbage thing that you’re selling it can feel like pushing a rock up a hill, but like who says that you can’t change your product offerings. So like just selling drones instead of picnic pants. Steve: Does that imply then that you should write your ads in a click biddy sort of way? Larry: Yeah of course because the higher the click through rate, if you can get people excited about clicking on your ads, that certainly will carry through to purchase, like if you look at doing [inaudible 00:35:57] on all click through rates and conversion rates of the products in your account, yes generally it’s the case that if you can get people excited to click on something, they will be more excited to also buy it. It may end and you’re like, wait a minute, I don’t want to pay for these damn clicks but like the higher click through rate reduces the cost per click for all of the clicks, you see what I’m saying? Larry: So it’s a pretty good idea yes. Steve: That’s interesting, okay yeah because I was just thinking in the exact same thing as what you said, as long as you don’t over promise in your ad, right? Larry: Yeah like free kittens in there, there is no free puppies to be had, well yeah that’s kind of like really going too far, but yeah up to the line and as far as you can go absolutely. Steve: Okay and we talked about remarketing a little bit already, but can we talk about RLSA for a little bit, first of define what it is and then are some ways that you use this feature more effectively in both your search and in your shopping ads? Larry: Sure RLSA remarketing list for search ads is just search ads like keyword based ads, but to people who are searching the keywords you’re interested but who have also recently visited your site. So it’s really a conversion detector so think of your spend Steve, like if you’re spending $1,000 on search ads, on average something like two thirds of those conversions that come out of that are going to be people who have brand affinity and have visited your site recently, do you see what I’m saying? Larry: And only a third of those conversions are kind of like net new like people who have just stumbled upon you on the first search, and the thing about that is typically what we see is that the remarketing spend, so the spend of the people who have visited you recently is like one tenth of the total spend. So I’m saying like you can generally speaking with RLSA you can get 66% on average of that conversion volume at one tenth of the total spend, so in terms of like the low hanging fruit and all this stuff that’s really where you should be focusing. For super competitive niches I would be going after RLSA only campaigns, so dumping vanilla search because that really is the most unproductive spend, you see what I mean? Larry: It’s like 90% of the spend producing a third of the results and then you start deploying that ad budget elsewhere for example like a radio ad or some other way to get people to know about your brand, that’s more scalable and cheaper. Steve: So when you have these lists do you end up bidding higher or lower on your remarketing list? Larry: It’s kind of complicated, so if you have competing kind of non RLSA ads for reasons unknown like it’s something to do with the option like I find that you do have to bid them up a little bit. Even if you’re applying those RLSA audiences as exclusionary, there must be like a million things that this action takes into consideration, like when serving these ads, but if you’re just doing RLSA only and that’s the only opportunity for these ads to run, then I feel like you don’t have to bid them up this much. Steve: Okay, what is atypical up bid for like RLSA ad? Larry: Right now for Shopping they could be like 25 cents something like that for USA based stuff, but that’s just the bid that’s not actually what you pay. Steve: Sure yeah of course. Larry: Your cost is usually lower than what you’re bidding. Steve: I think mine is like 20% right now, I don’t know f that is the best practice, or not, that’s just what I’m doing. Larry: Yeah I think it varies but yeah sure. Steve: What else was I going to ask, oh one thing that I’m doing personally now is using the look alikes that Google offers, what is your experience been with them and how did they perform? Larry: So in general look alikes it’s going to do better than no audience targeting associated with the keywords because what you’re saying is that the people who are searching for these things also meet sort of these bio persona characteristics, so it’ll do a little bit better. But the reason why RLSA works so great is because there’s brand affinity, so like they’ve actually visited your site, and they’ve consumed some memorable inspirational video content about why this Amish gazebo is so great, how it’s going to change your life. So the problem with some audiences is while they have the right demographics interesting behaviors, they don’t have the prior kind of brand affinity experience that is so integral to raising the click through rates, and raising the conversion rates, so it’s kind of like in between. So it’s like you’re going to get more clicks and more conversions because you’re kind of casting a wider net, but that net is more diffuse and it’s not going to result in the same types of conversion metrics and ROI metrics as RLSA. Steve: So if I could just summarize everything that we kind of talked about, you want to put content out there to get them on a list, and then you want to use remarketing first. Would look alike audiences be your next logical step before doing the just generic AdWords to broad audiences? Larry: Of course, of course I guess it’s kind of an intermediary step better than nothing and then of course generically targeted vanilla keywords with no associate audiences I think is kind of the least interesting, because generally you’re paying the most there for the least qualified searches. Steve: Okay and what about the display network, like when does that factor in outside of remarketing? Larry: There is a lot of interesting developments in display marketing, so I think Google is feeling the pressure to kind of up their game there because Facebook and Google display networks are kind of competing for display ads essentially social ads are kind of like display ads. They’ve recently very quietly changed their targeting for Google display ads so that when you’re doing keyword targeting it used to be largely based on what the content of the page was, but now they’re making it based on search history, you see what I’m saying? Larry: So I think keyword targeting especially if you’ve got kind of unambiguous keywords that could be really great opportunities for ecommerce display targeting. The other one is they’ve always had customer affinity audiences, so that’s just like based on your search history we think that you’re trying to buy a car, or we think you’re trying to buy a house or something like that. There’s like 2,500 of these affinity markets – customer affinity in market segments sorry and those are very interesting non remarketing ways of getting in front of people who are likely to buy your stuff. Larry: I haven’t been using those for like two years, so yeah I mean if you can get it to work great, but it wouldn’t be on my top ten. Larry: I suspected it’s like Google tweaked their organic algorithm so like less of that valuable Google traffic is getting to them and that means your ads that show there are going to be a little less qualified, that kind of stuff. I think Google is trying to tighten the screws a little bit of all this free value they’re giving away. Steve: And then my final question for you is you’ve run your store, and you’ve got marketing dollar, do you spend those on SEO or SEM, like how do you make the decision? Larry: Well I think that SEM works it’s – like if you’ve been following what we’ve been talking about like I’m saying that SEM works at its very best when you’re amplifying your best organic content, do you see what I’m saying. So like if you have this like you unicorn video like the [inaudible 00:44:54] video asset which is kind of an organic asset, and then you promote kind of that, that’s a winning strategy. So I think you need both obviously, otherwise you just won’t have anything great to amplify. Steve: You keep mentioning video over and over and over again, so it implies that video is like the medium of the future as opposed to just good old text content? Larry: Yeah because that’s where all the time on the internet is being spent on mobile and just like video is so much of more optimized for delivery for mobile. Like just think about you’re doing other stuff, you’re on the go, this thing is so much more memorable and you can make it so much more information, yeah it sticks. Steve: Okay is that what you’re doing with like WordStream for example now when you’re running your ads for your own site, like is it all landing pages with video? Larry: That is our like over the last six months we’ve been investing heavily in that and yes like video. We’re creating like all these video ads and stuff like that yeah. Steve: Okay, oh cool Larry, we’ve been chatting for quite a while now, it doesn’t feel like it but I want to be respectful of your time, where can people find more about you and the services that you have to offer? Larry: For me personally the easiest way to get hold of me is on Twitter, this is @larrykim, for my company WordStream obviously just go to wordstream.com and we’ve got thousands of pages and videos of stuff that you can read or browse through. Steve: Cool, thanks a lot for coming on the show Larry, really appreciated. Hope you enjoyed that episode. Larry really knows his stuff, and actually since we recorded this episode he’s actually stepped down from WordStream and has started a brand new company so stay tuned. For more information about this episode, go to mywifequitherjob.com/episode159. And once again I want to thank Sellerlabs.com for sponsoring this episode. Their tool Ignite is actually what I use to manage my Amazon pay per click campaigns. Instead of the old tedious way of generating reports and analyzing your ads campaigns in excel, Ignite aggregates all the info for you in one place and allows you to quickly visualize your data and make decisions fast. So not only does it save time but it also makes managing your Amazon campaigns so much easier. So head on over to sellerlabs.com/steve and sign up for a free 30 day trial, once again that’s sellerlabs.com/steve.